Mix all ingredients in a bowl , add water to make soft dough. Make a small round shape, fry until golden brown. Ohhh...I like pakodas...I have some mint chutney in the fridge. I might just make this for afternoon tea tomorrow. Thanks for the recipe, dear. Yummy snack...guess it would be great for a lunchbox. Fried foods always look delicious! 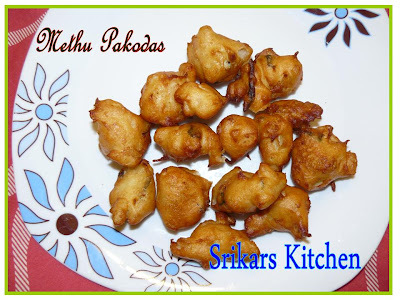 Methu Pakodas looks really crispy and tempting..
Craving for some fried food now... been ages! Those look so cute and waiting to be eaten! pakodas look so good... how thick should the batter be?